Discussion in 'Xbox (Original console)' started by S_crumb, Feb 12, 2019. Hey guys. In my quest to eliminate discs and cartridges from my collection, I've finally gotten around to my Xbox. I haven't touched it since I lived in Asia back in the early 2000's. I had bought it brand new and taken it to the neighborhood pirate game shop and had a modchip installed. This was probably 2003. I fired it up for the first time since then and noticed that the boot screen shows a Matrix modchip and a very old version of Evox. I remember that I was only using backup discs and hadn't upgraded the HDD to load games from it. The disc drive no longer opens. I just opened the console to see what's going on and remove the clock capacitor. I noticed this. I think this is the modchip. That green wire, which I think is a ground, isn't connected. Should that be soldered down somewhere? Since I have a modchip, I should be able to upgrade my HDD easily? Any thoughts as to max size? As I understand it, the Matrix chip has limited space for BIOS (256k?) so there may be versions that won't work. What should I be looking at to upgrade the dash? Now to figure out how to get the drive opening again. Change the belt of the drive, remove clock capacitor because could be leaking, clean everything and you can install a bigger hdd. 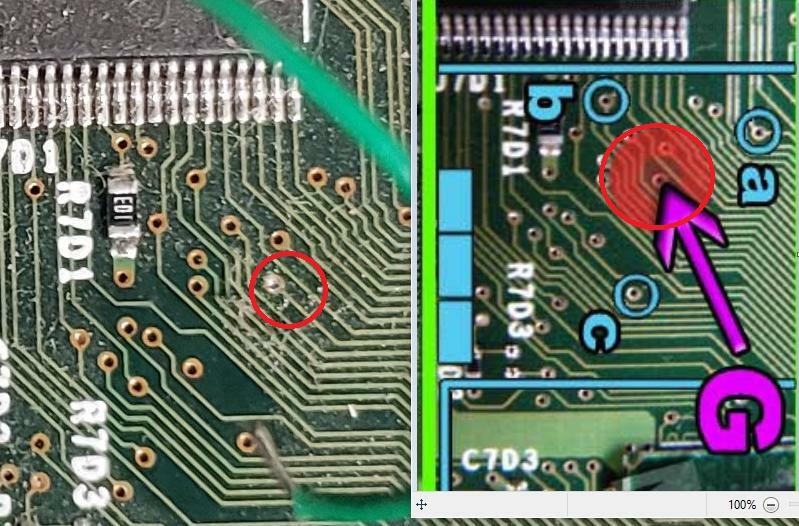 Not too familiar with Xbox, but is that board soldered to that ground plane and then there's the green wire that's soldered to it floating? 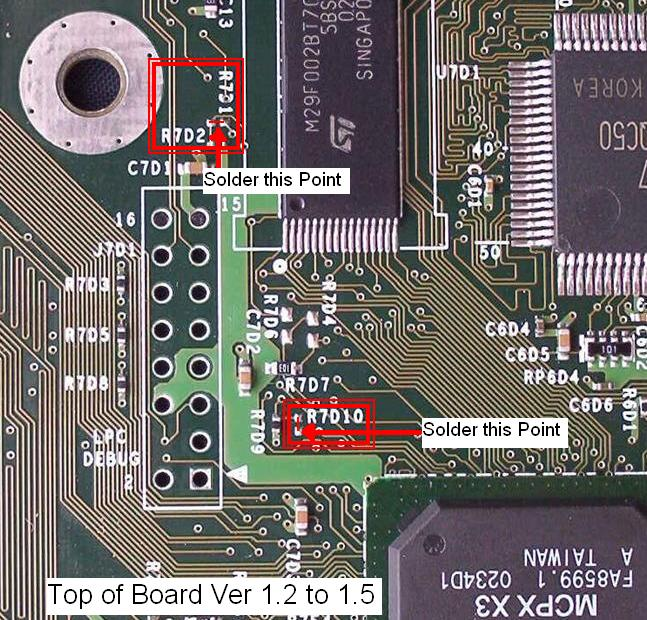 Looks like it's supposed to connect to the chip, but then it doesn't make any sense if the board itself is soldered to ground the way it is. 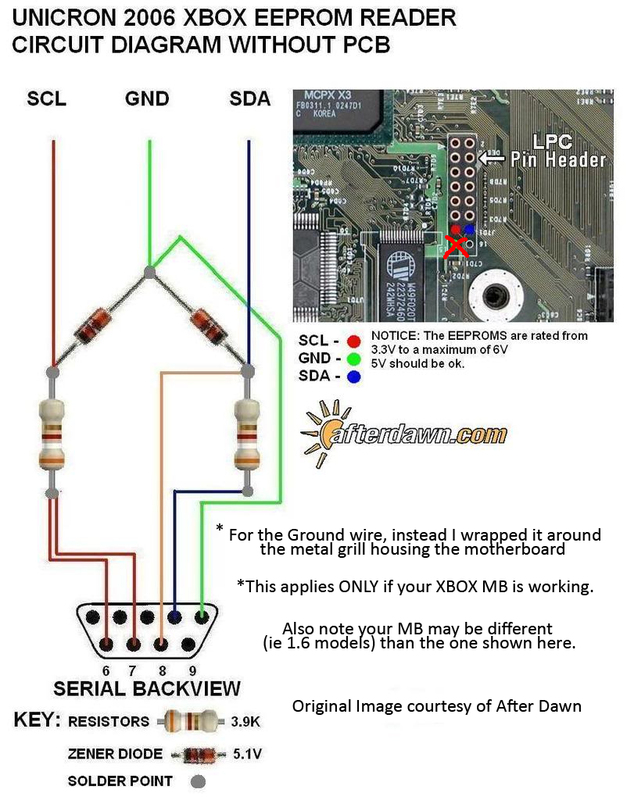 I have no idea, could just be a secondary method if you didn't want to use the QSB grounding? This via looks like it's been tinned, possibly it goes there but I'm not sure..
That wire is specifically soldered to the grounding point and then floating over the board. Oh man. Maybe. I hope not because that is TINY. ....I just can't seem to find install instructions for the Matrix chip. Can you clean the area with alcohol and an old toothbrush or something and post another picture without all the dust? If that is where it goes it's not too hard to do. Since it's already tinned you aren't getting the wire in it; I would re-tin the wire, push it onto the via , flood both with flux and then heat the wire/via and it should make a solid connection. Give it a gentle tug after it cools to be sure it's in place. But this could all be for nothing as I have no idea what chip you have or if that's just corrosion at this point. What's the boot screen look like? Oh, here's the Matrix install manual in PDF format from the Wayback Machine. But wait, that's not the Matrix modchip you have that's shown in this manual. The one in the manual uses a solderless install with pogo pins built into the modchip itself. What you have is an xecuter 1.0 or 1.1 modchip - see here. S_crumb and Nully like this. Via needs to be grounded, could have been worse I guess. I'd give it a shot if you have a soldering iron handy. I happen to have a brand new Hakko soldering station that hasn't been used yet. Perfect occasion. Btw, I dont see this mentioned anywhere, that chip is likely a Xecuter 1 not a Matrix chip, there are a couple clone chips by different names that look exactly like it though so couldn't say 100% its not one of the clones. However, this chip is NOT flashable. its one of the early chips that more or less patch the retail bios on bootup. Really limited capabilities and wont be able to support large hard drives. It would be better to remove the chip and perform a tsop flash. S_crumb, KaosEngineer and zzattack like this. Oh.....back to the drawing board. Thanks for the tip. Looks like I've got a softmod shopping list to put together. You can buy an Aladdin chip for $3-4 on eBay or just make a bridge for the TSOP flash, it's very easy. Afterwards just burn a Hexen disc and flash the custom BIOS. I'm going to go the TSOP route. As I understand it, I'll need to softmod the system first. Just throwing out as an alternative, since the DVD drive doesn't work. You can build an EEPROM reader, dump the EEPROM on PC, set up a new drive on a PC with custom dash (can also use original hard drive), relock it, and put it into the Xbox. From there you can set up the TSOP flash which would eliminate the need for a locked hard drive. This easy HDD upgrade just keeps getting worse. I desoldered the old modchip. Ebayed a Xbox->USB cable and a copy of Splinter Cell. Patiently waited for them to arrive. Downloaded and began to install Rocky5's softmod tool. Connected the DVD drive and original HDD. Apparently the fix is to hotswap. Hopefully I can use the new SATA drive I bought to upgrade the old one. I can't TSOP yet because I can't softmod because I can't boot off of a disc? 1. Build or buy an EEPROM reader and find out what my key is, then I can use that to unlock the drive? 3. Throw it out of my window and buy a new one. This thing is nickel and diming me to death....I should've just bought a pre modded machine and enjoyed my life. Interesting. The dead Xbox I bought today has an Aladdin XT Plus 2 installed. I wonder if they screwed up the installation. I could salvage this chip maybe? Do you have a Raspberry Pi? 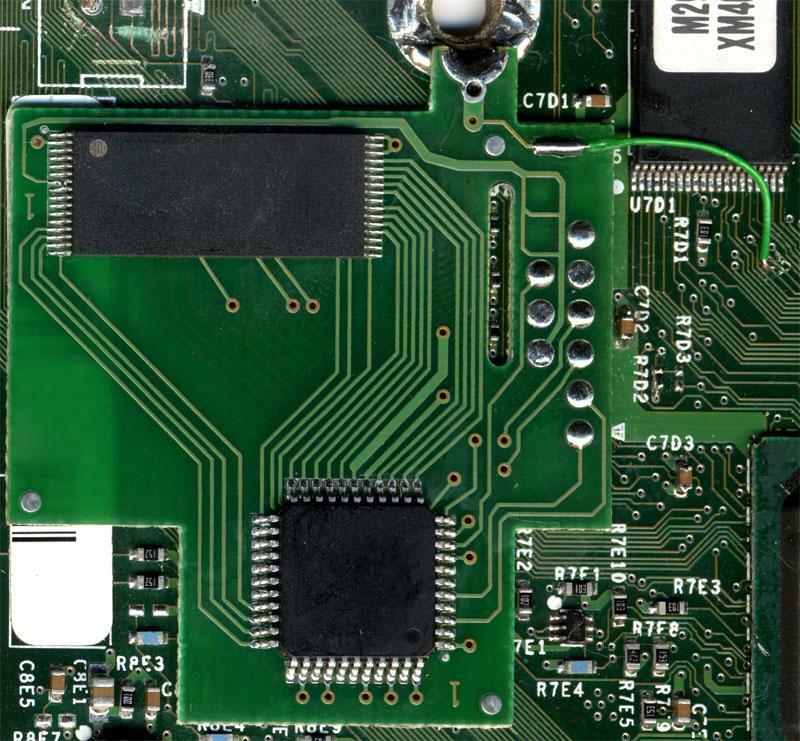 It with PiPROM software can read the configuration EEPROM data. Thanks for this info! This is really cool, seeing as the original EEPROM reader was serial-based and as we know, the ports are usually not available on modern PCs.